The team underwent an intensified fitness test under the blaring glaze of the sun at the football academy in ‘Atele, Tuesday 7 December with Coach, Chris Williams, urging the boys for perseverance. And the boys delivered their personal best in comparison to their previous assessment two weeks ago as the youngest of the bunch, 14 year old Taniela Vakauta of ‘Api Fo’ou College reflects. “After the fitness I feel happy, it gives me confidence, it encourages me to improve my performance” Vakauta said. For the team, there is improvement but there is still a long way to go according to Coach Williams. “They are a great bunch of boys, and I absolutely love coaching them, and they’ve improved a lot in the past two weeks but to be competitive we’ve got to improve a lot more. To put into perspective, we play Tahiti, who trained for one year, we play Solomon Islands who’ve train for one year and we get one month. So we need to work hard, and we go in there, I want to win, so we still need to improve a lot more” Williams said. The team came into camp this week and despite having assembled for only a month, their coach is optimistic. “There’s definitely some great raw talent here and I guess coming from my background, back in Australia, there’s definitely players who if they applied themselves in the right way could be professional footballers, I think its just trying to make sure that they change their attitude a little bit, and because they have the skills, they just have to get a little bit fitter and hopefully get a more professional attitude but there’s definitely some great players here and we’ll try and nurture that and try and get the best out of them in New Zealand” Coach Williams said. 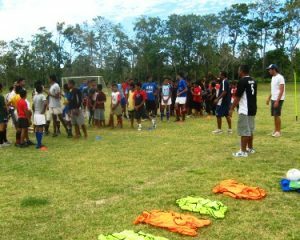 The team will represent Tonga for the first time in January 2011, in New Zealand, at the OFC’s FIFA U17 Men World Cup qualifier. Previous Post Tonga attends Just Play instructor's course. 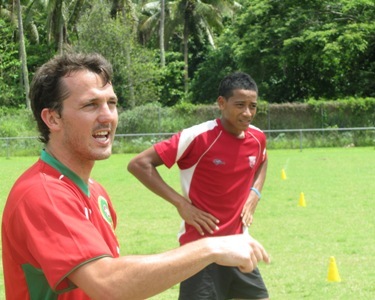 Tonga attends Just Play instructor's course.